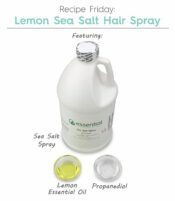 Achieving summer beach hair is as easy as this simple recipe for Lemon Sea Salt Hair Spray. The Sea Salt Spray helps hold that beach-y, tousled hair look and lemon helps add summer highlights. Working with your hands is part of the fun of making your own products. When you’re working and your hands get dry, lotions are out of the question as they can leave a greasy residue on your palms and fingers. Enter the crafter’s lotion stick, which applies moisture to the backs of your hands without the residue, resulting in clean and hydrated hands. 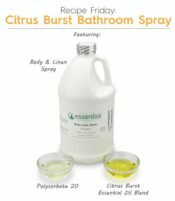 This easy to make bathroom spray leaves your bathroom smelling fresh and clean every time without all of the harsh, synthetic chemicals you find in other sprays. Making your own fabric softener is quick and easy! This recipe uses Essential’s Basic Conditioner with vinegar to help soften fabric, and adds the Bloomer’s essential oil blend for a lovely springtime fresh scent. 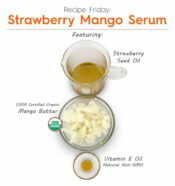 This simple, 3 ingredient serum is the perfect solution for those who want a simple, effective serum for day or nighttime use. The organic mango butter leaves skin soft and nourished and the strawberry oil absorbs quickly and imparts a divinely delicate scent. 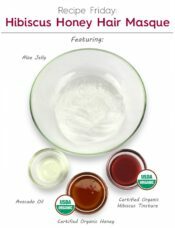 This recipe is simple and easy to make, and leaves a luxurious satin finish on skin. It’s a common fact of chemistry that, “like dissolves like.” Even though it may seem counter-intuitive, cleansing your skin with oil is the best way to remove oil — and any dirt or makeup trapped in that oil — from your skin! 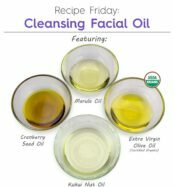 This recipe uses four oils known for their skin benefits and their ability to leave your face clean and nourished at the same time! 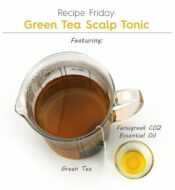 Healthy hair starts with a healthy scalp and this Green Tea Scalp Tonic is designed to calm, moisturize and balance your scalp. Hibiscus has long been used by Indian women to give hair shine, bounce and lessen frizz. Honey is a natural humectant full of antioxidants and nutrients to help moisturize your hair and scalp. Avocado oil is well known as a nourishing oil for both scalp and hair helping to add luster and prevent hair breakage and split ends. Cold weather means our feet are constantly covered with socks and slippers when we’re indoors and shoes and boots when we’re outdoors. 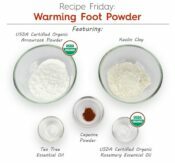 This warming foot powder will help keep feet dry, warm, and best of all—smelling fresh and clean! 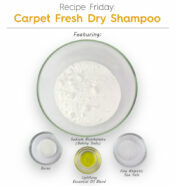 This is a fabulous dry shampoo for carpets! The borax, sea salt, and baking soda all work to bind to dirt and odors leaving your carpets smelling fresh and clean, naturally!